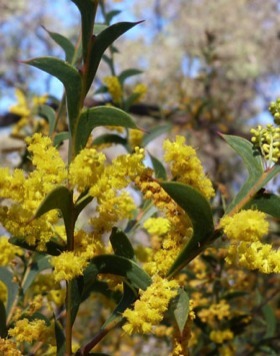 Acacia Triptera, the Spur Wing wattle, occurs in NSW and Queensland on gravel ridges, in Victoria it is a rare plant but does grow in the Warby Ranges. It is a dry-country shrub, 1 -3 metres high and can be upright with low spreading branches. The leaves are stiff and taper to a sharp point. “Triptera” means 3 winged, which describes the leaf base on the stem, like a wing. This wattle is a beautiful, lesser-known one with 2.5 cm long flower spikes in a soft, rich yellow.